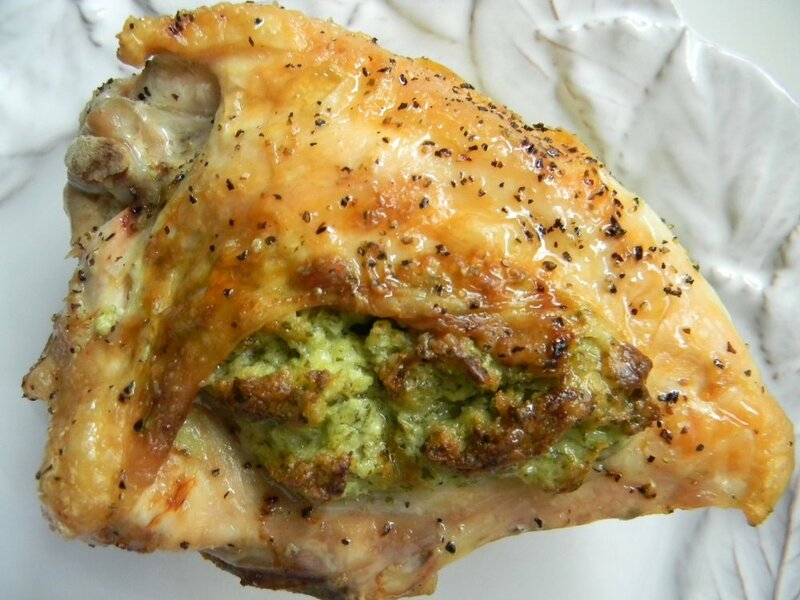 Goat Cheese And Herb Stuffed Chicken Breasts….Step By Step Instruction…. 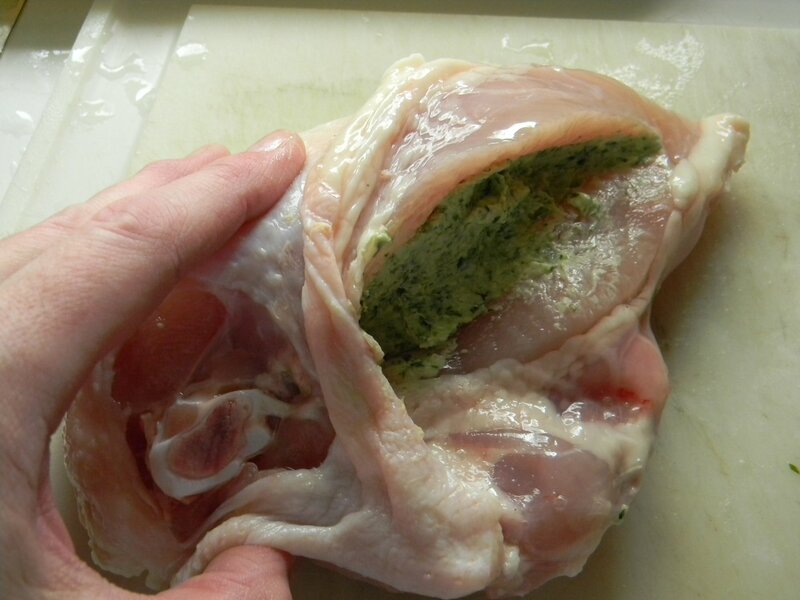 I love stuffed chicken breasts but sometimes they can dry out. I decided to stuff bone in breasts with skin. The end result is moist and juicy. I’ll take you though how to prepare the chicken breasts for stuffing. Serve with rice pilaf and a simple vegetable or salad. 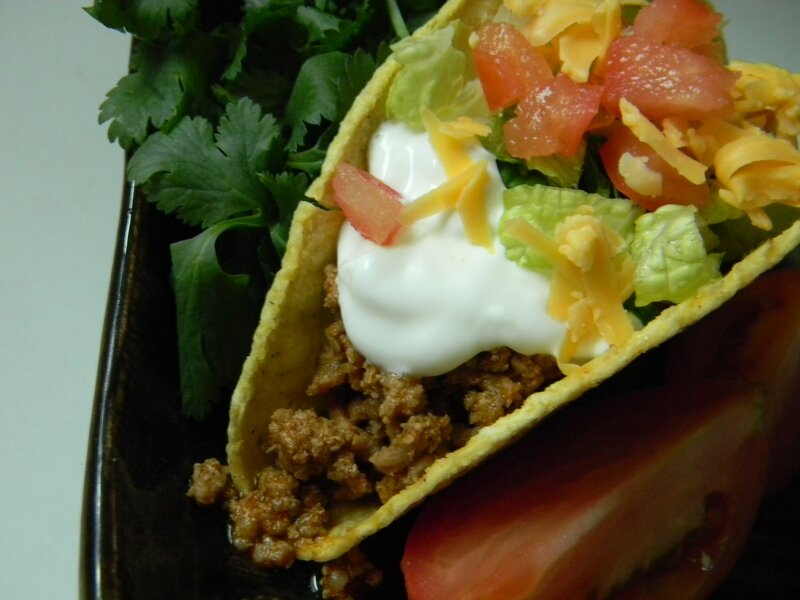 They can be stuffed ahead of time and ready to go in the refrigerator. Bake while dinner guests are enjoying appetizers and cocktails. So easy! As with any recipe, you can make your own yummy variation. I think sundried tomato pesto and goat cheese would be fantastic as well! Don’t care for goat cheese? Use blue cheese instead. The possibilities are endless! Start by gently pulling the skin back without tearing it. Try to keep the skin intact a little on the rib side as well. 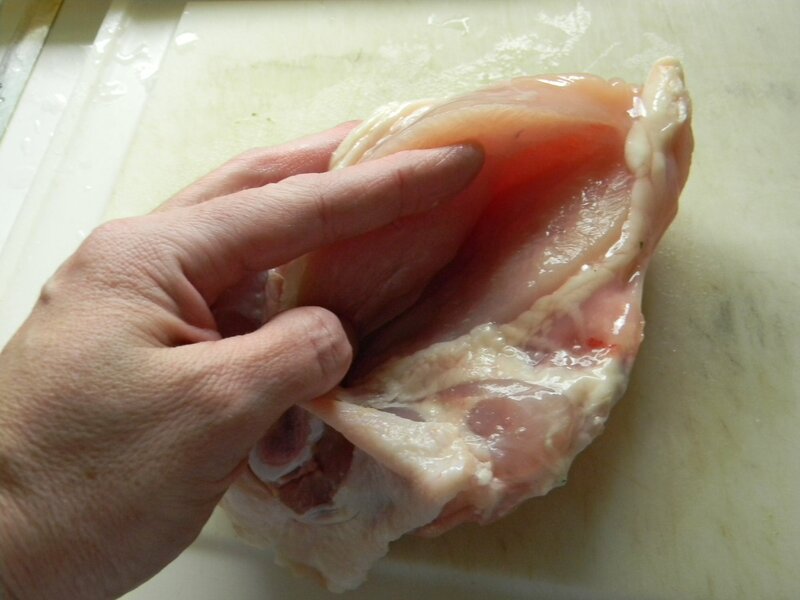 Using a very sharp knife, make a slit in the flesh, try not to cut completely through the breast. 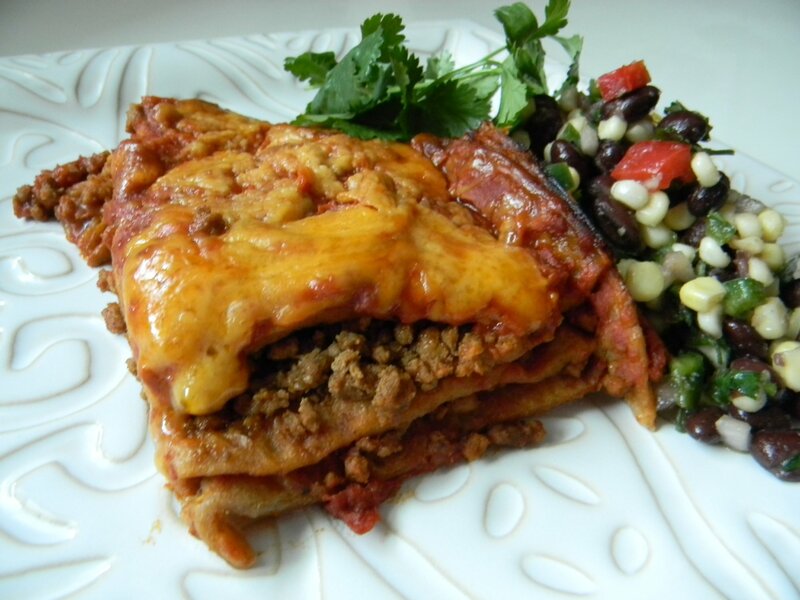 The slit should be large enough for about 3 tablespoons of the cheese filling. Stuff the breast with about 2-3 tablespoons of the cheese filling. Gently bring the chicken breast back together, pulling the skin over to cover. Season generously with kosher salt and pepper. Now you’re ready for the oven! If you are making them ahead to bake later, cover and refrigerate immediately. Take them out 30 minutes before baking. 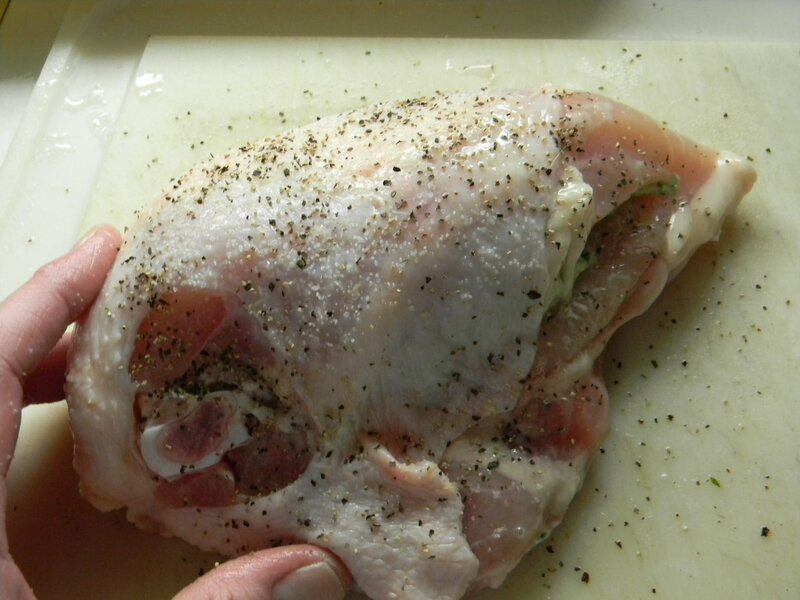 Give the chicken a light drizzle of olive oil just before going into the oven. 1) Foil line a roasting pan large enough to easily fit the chicken breasts. Preheat the oven to 375′. 2) In a medium size bowl with a hand mixer, beat the goat cheese, cream cheese and milk until smooth. Gently stir in the rest of the ingredients until well blended. 3) Rinse and dry the chicken breasts. Gently pull the skin back from the center of the rib, keeping it intact on both sides of the breast. Using a sharp knife, cut a large horizontal slit in the chicken breast, being careful not to cut completely through to the other side. 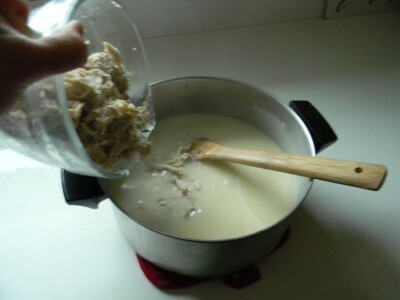 4) Stuff each breast with 1/4 of the cheese mixture. Gently pull the flesh and skin back over the stuffing. Season generously with kosher salt and pepper. Place into baking pan and lightly drizzle the chicken with olive oil. Bake for 50-60 minutes. Allow to sit for 10 minutes tented with foil before serving. Makes four generous servings. This chicken couldn’t be more simple. Start out by putting some color on the skin by grilling or broiling, then finish cooking in the oven. 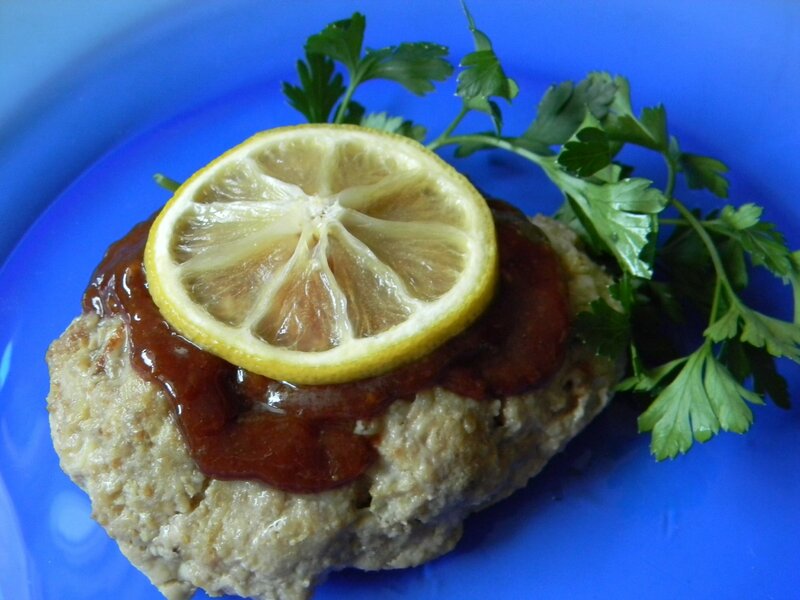 The marinade has few ingredients that most of us have on hand. Whisk all of the marinade ingredients together in a small bowl and pour over the chicken in a large zip bag. Marinate the chicken 30-60 minutes. 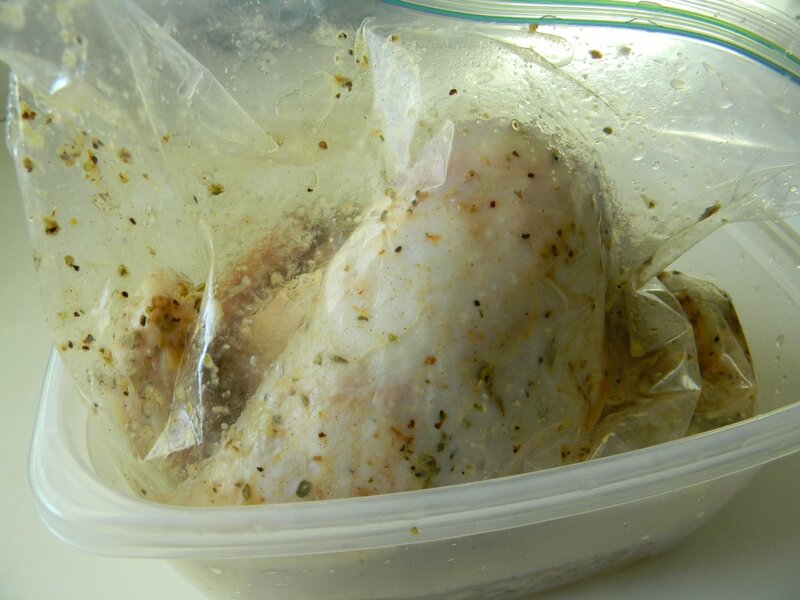 Place the marinating chicken into a plastic container so avoid any leaking in the refrigerator. When you marinade this way you can mush and squish (official cooking terms) it around to distribute the lovely marinating liquid. 1) Whisk all marinade ingredients together in a small mixing bowl. 2) Place chicken into a large zip bag. Pour marinade over chicken. Place in a bowl and refrigerate 30 minutes to an hour. Half way through marinating, shake up the bag and move the chicken around. 3) Preheat the grill and the oven to 350′. Foil line a baking sheet. 4) Grill the chicken just until there is good coloring on the skin, 10-15 minutes. Place on foil lined baking sheet and bake for 45 minutes. Makes 5-6 servings. Serve with hummus and warm pita bread, and salad. Turkey Pot Pie With A Twist…..
Who doesn’t like pot pie? The perfect combination of creamy savory filling topped with a buttery crust. I decided to use as many Thanksgiving leftovers as possible for my pot pie. Turkey, of course, turkey stock from the carcass, and stuffing. Stuffing? 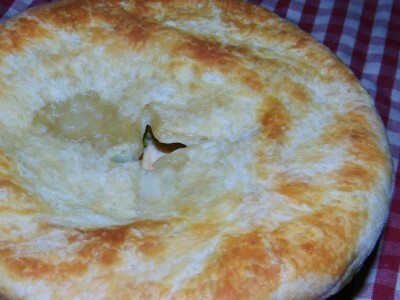 I decided to press a thin layer of stuffing into the bottom of each individual pot pie. It was DELICIOUS! Turkey, stuffing, vegetables, gravy and a killer crust. YUMMY! 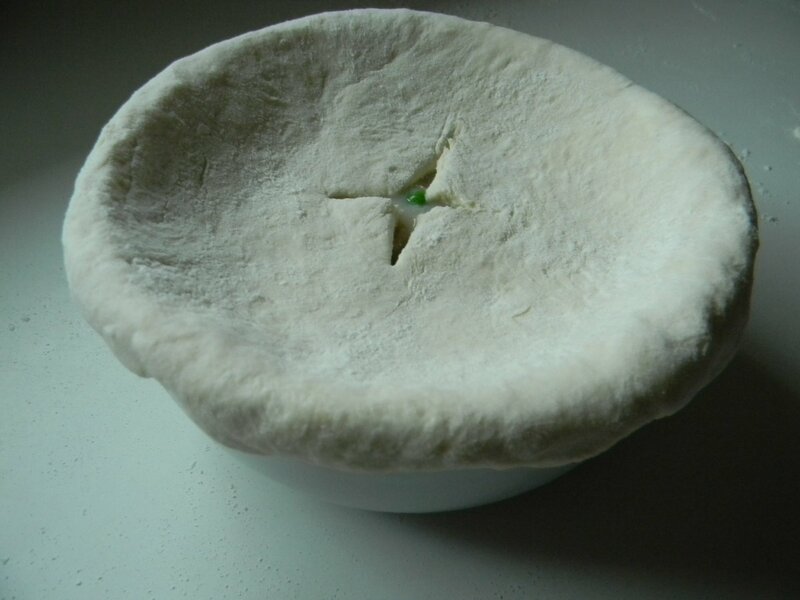 Of course, you can make this pot pie without stuffing. 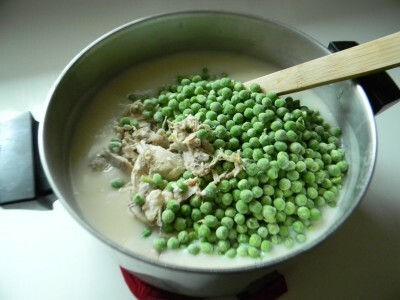 You can also easily substitute chicken and chicken broth for a chicken pot pie. Add whatever frozen vegetables you like. I would normally add a one pound bag of frozen mixed vegetables but all I had on hand were frozen petite peas. Gosh, you could substitute all vegetables and vegetable stock if you wanted a completely vegetarian pie. It’s your choice. This recipe is large, it makes 8 individual pies. You can very easily cut the recipe directly in half if you like. I use a food processor for the crust. It goes quickly and perfectly blends the cold butter into the flour. 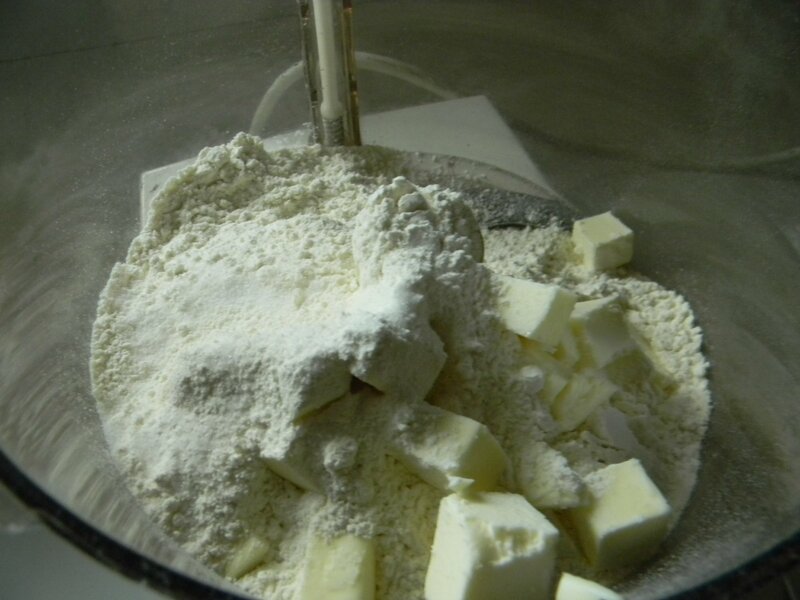 Add 4 cups of flour, 1 teaspoon of salt and 1 stick of unsalted butter cut into 1/2″ cubes to the food processor . Pulse 15 times, should be perfect. It should look like this. No uneven lumps. 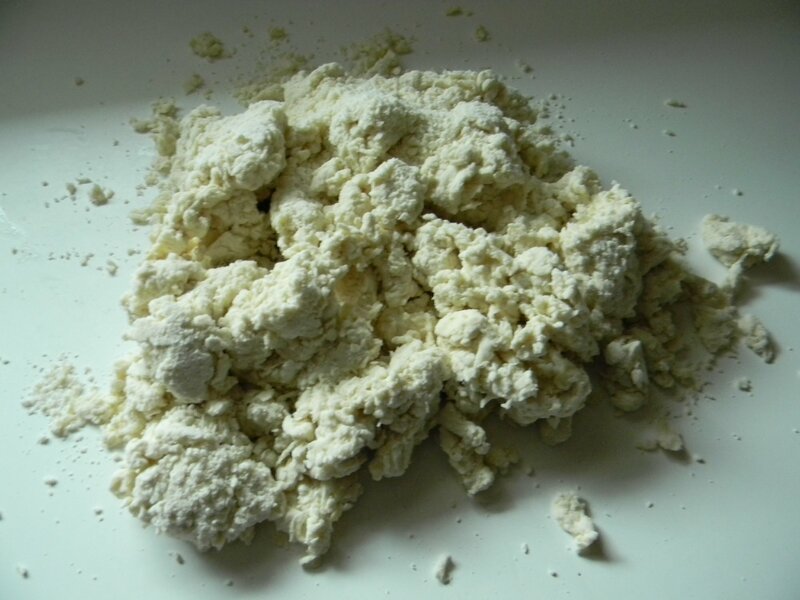 Should resemble cornmeal. Alternatively, you could use a pastry blender to incorporate the butter into the flour. Dump the mixture into a large mixing bowl. Next you’ll need to add ice water. With this recipe you can go ahead and add 1 cup of ice water and mix with a fork. 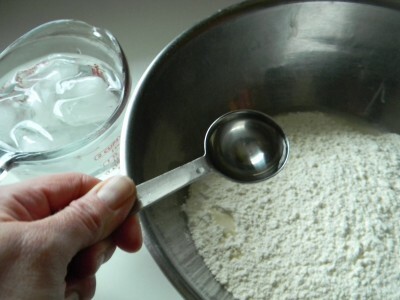 Add additional water a tablespoon at a time so that it looks like this. You do not want lots of dry ingredient left in the bottom of the bowl. Most of the ingredient should come together and be pretty moist but not too wet. 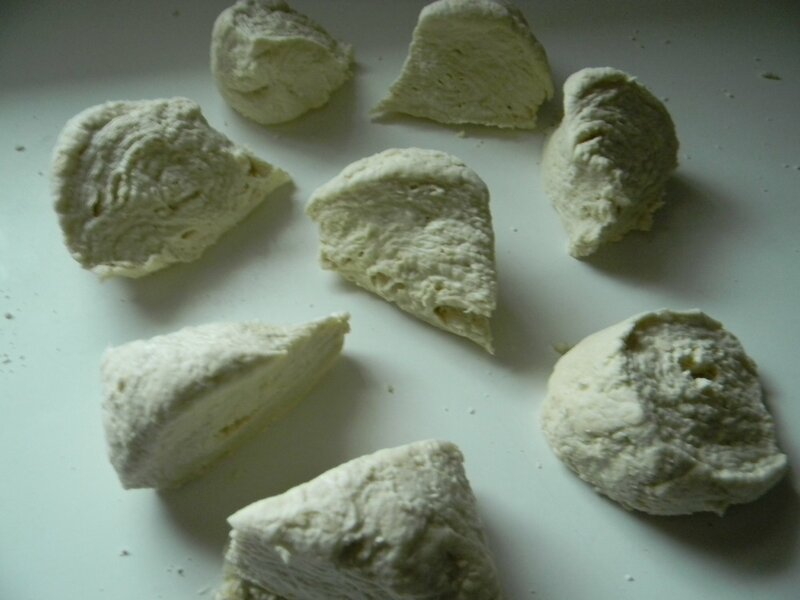 Dump the dough onto your board or counter. 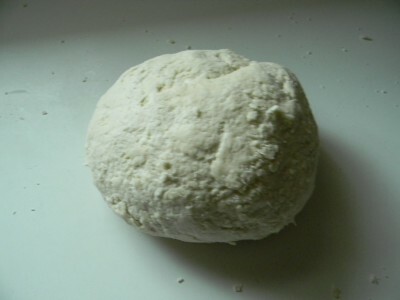 Form a ball of dough with your hands, kneading only 2-3 times. Cut the dough into 8 equal pieces. Do this by first cutting it in half, then half the halves, you know what I mean. 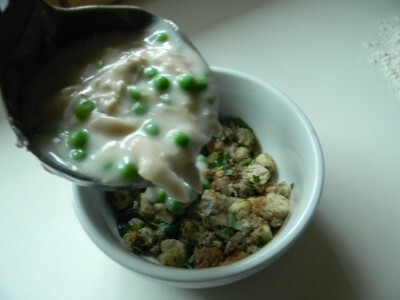 Place the chunks of dough into a bowl and refrigerate while you prepare the filling. Warm 6 cups of turkey (or chicken or vegetable) stock in the microwave until just warm (like the temperature you’d give to a baby). When you add this to the flour mixture below this will prevent lumps. Have a large spoon and a whisk handy. 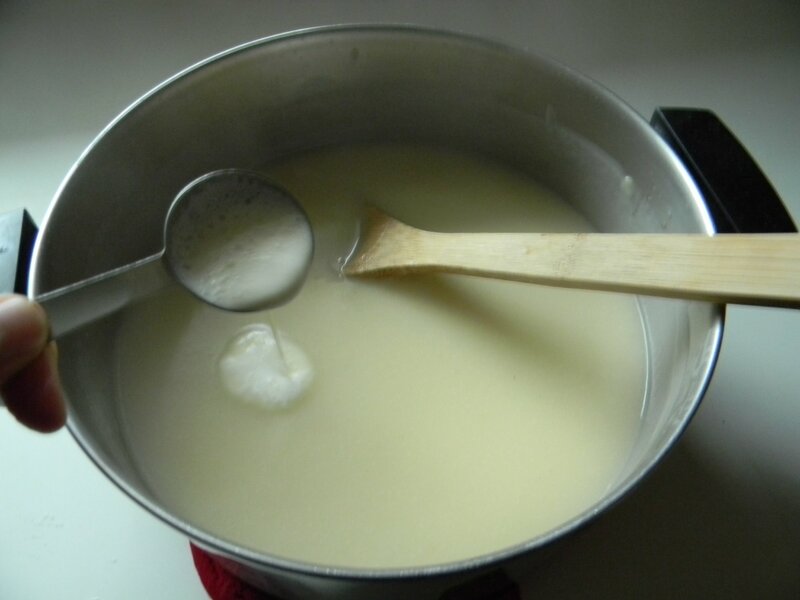 Melt one stick of butter in a large pot. 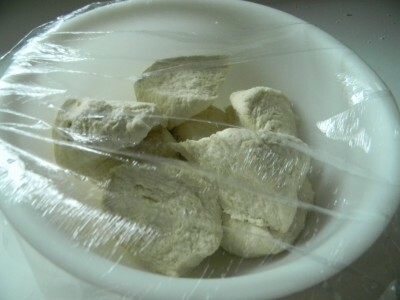 Once it’s completely melted, add 1 cup of flour. Cook over medium heat for a couple of minutes. 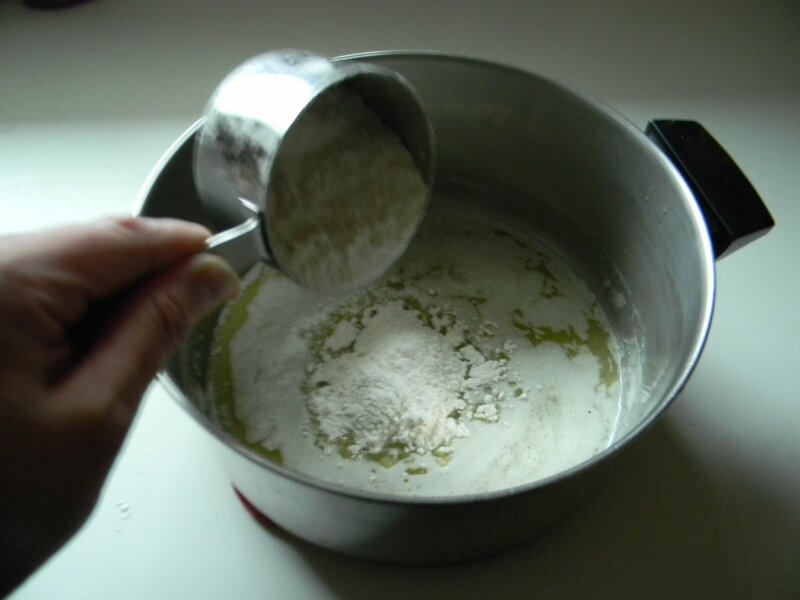 With your whisk in hand, add all 6 cups of the warm stock to the flour mixture. 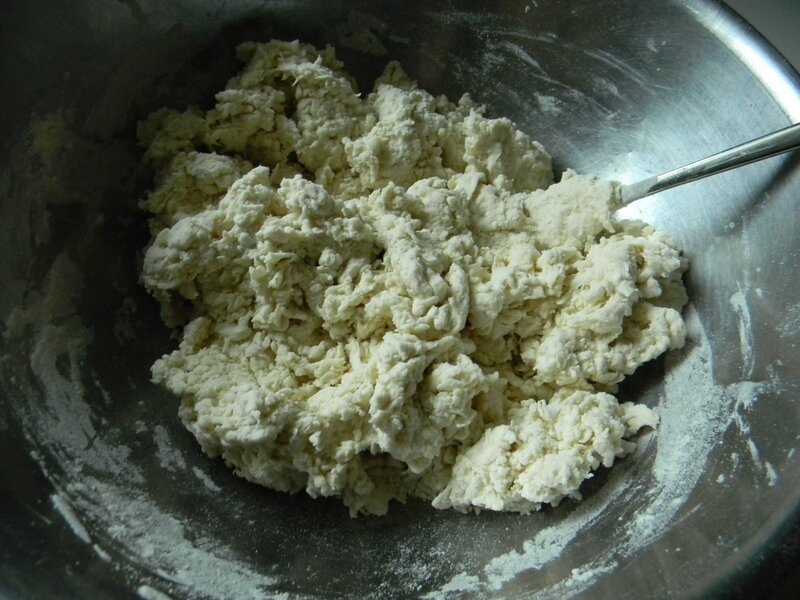 Whisk the mixture to prevent any lumps. Cook over medium heat, stirring constantly until it comes to a boil. Cook another couple of minutes. Remove from heat. Add a couple of tablespoons of heavy cream or half and half. Optional. This is the perfect time to taste and add salt and pepper to your taste. Add 5 cups of shredded cold turkey. And 1 pound of frozen vegetables, you can see that I used peas. Don’t worry that it will cool the sauce. It’ll be in the oven soon and will make it easier to place the crust on the top. You will need eight 2 cup oven proof dishes. Coat with cooking spray. Layer 1/2 cup or so of prepared stuffing. (optional) Evenly distribute the filling into the prepared dishes. 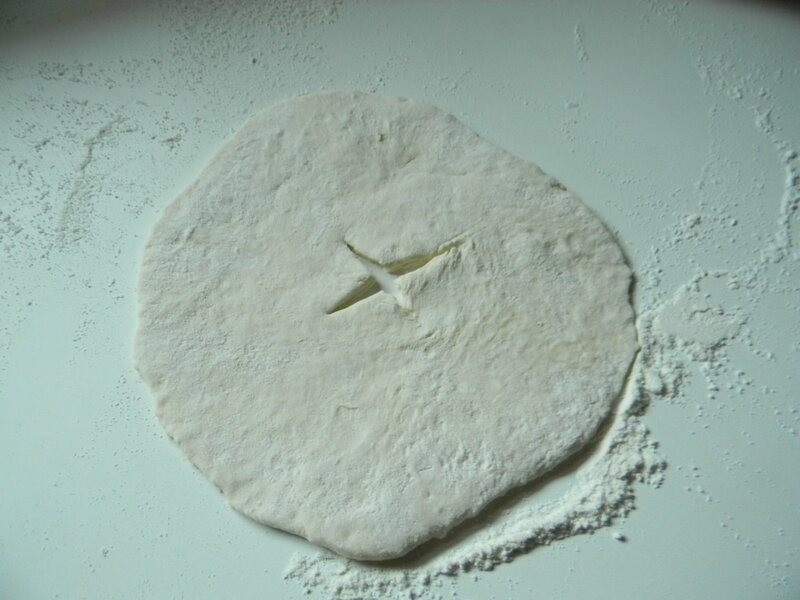 Time for the crust. 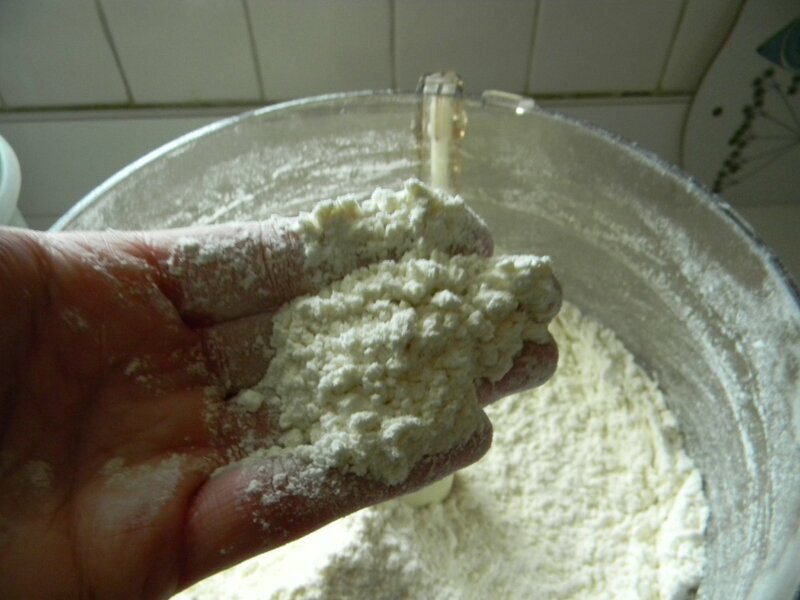 Form each chunk of dough into a ball and roll out on a floured board until large enough to for 1″ of dough to go over the side of the bowl. Cut a slit in the top for the steam to escape. 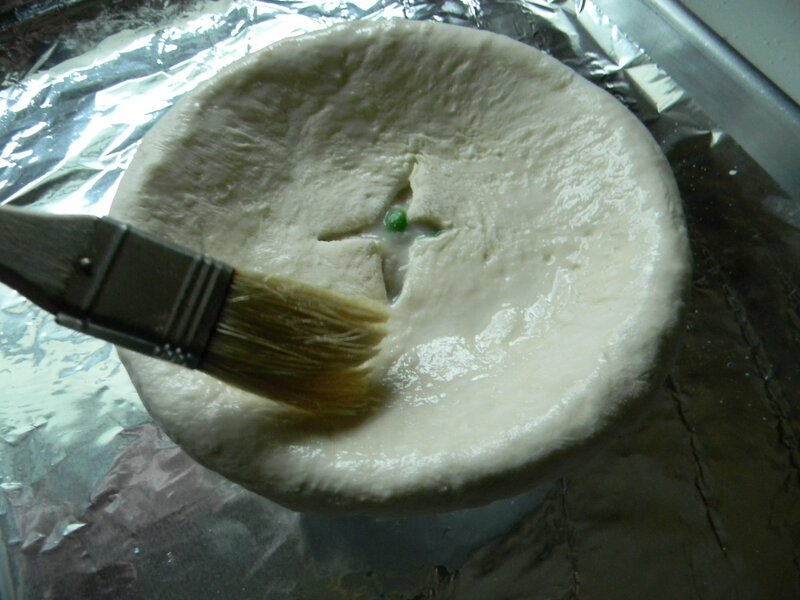 Lastly, using a pastry brush, coat the crust with milk. This will make for a nicely browned top. Bake at 350′ for 45-55 minutes or until bubbly and nicely browned. Serve with a salad with a vinaigrette. Serves 8. 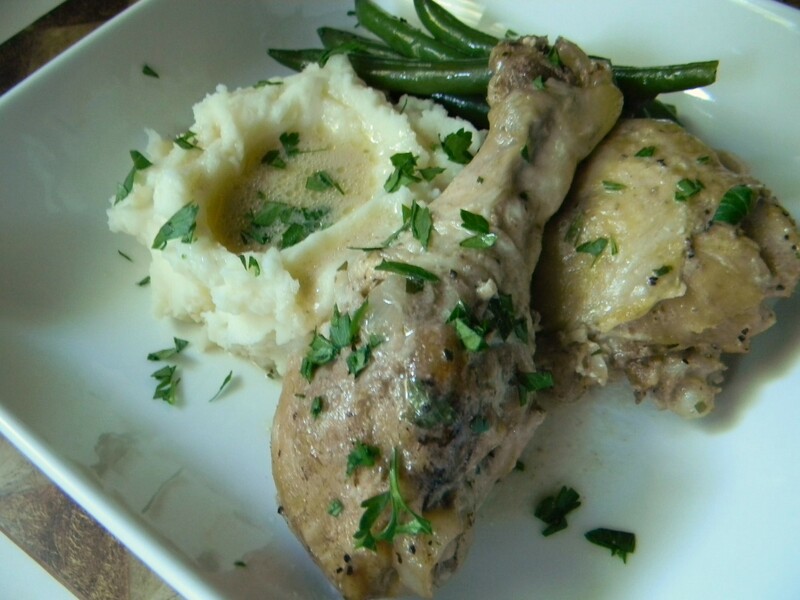 Dijon Chicken with Sour Cream Mashed Potatoes…. This chicken is tender and luscious. I served it with sour cream mashed potatoes which was great with the pan sauce. Throw in a salad and you have a spectacular dinner! The best part about it is that it’s so simple. 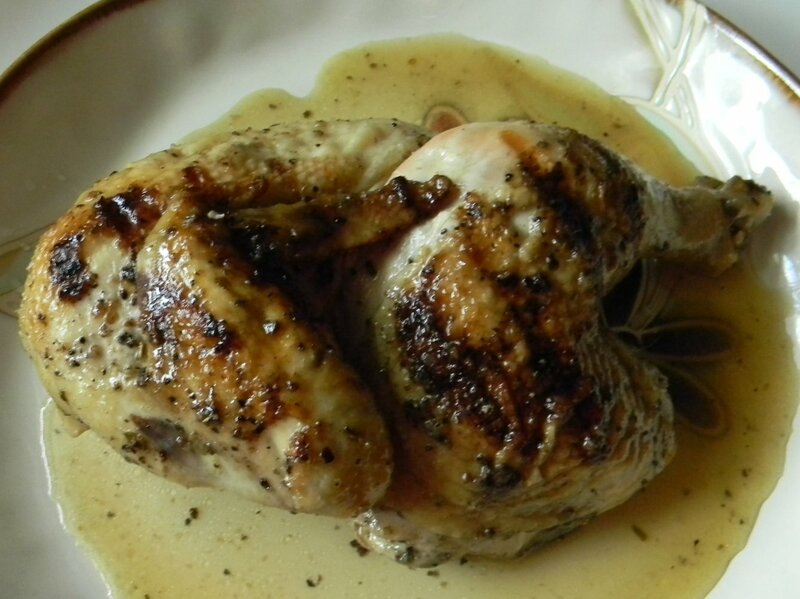 I used legs and thighs as they end up being incredibly moist and succulent. Prep time takes about 20 minutes then finish in the oven. I would definitely serve this at a dinner party. If you’re serving mashed potatoes with this chicken, prep the potatoes into the boiling pot before you start the chicken. 1) Preheat the oven to 325′. 2) Season the legs and thighs with kosher salt and pepper. Heat a heavy skillet that has a tight fitting lid over medium-high heat. Brown each seasoned piece of chicken. Remove from the pan onto a plate. 3) Add the onion to the pan. If you have a lot of goodies sticking to the bottom of the pan, add a couple of tablespoons of the broth to deglaze. Once the onions are soft, add the garlic and cook another minute. Add the coriander and broth to the pan and add the browned chicken pieces. Cover with the lid and into the oven for 45 minutes. 4) Remove the pan from the oven. Remove the lid (carefully!) and remove the cooked chicken onto a serving platter, cover with foil to keep warm. 5) Put the pot over medium heat. Whisk the dijon mustard, sour cream, and tarragon in a small bowl until all ingredients are incorporated. Whisk into the pan juices. Cook about a minute. 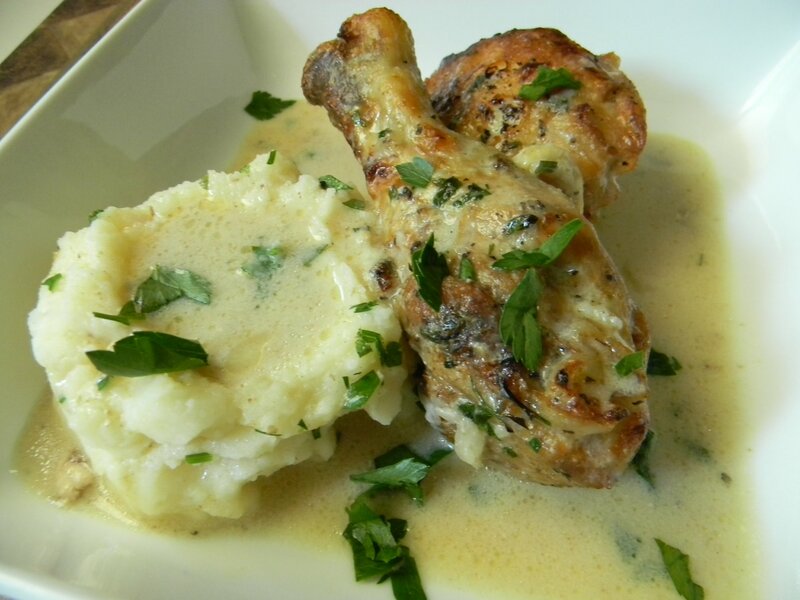 Pour the sauce over the cooked chicken…Serve immediately. Makes 6 servings. 1) Peel and slice the potatoes and put them into a large pot. Cover with water and add salt. 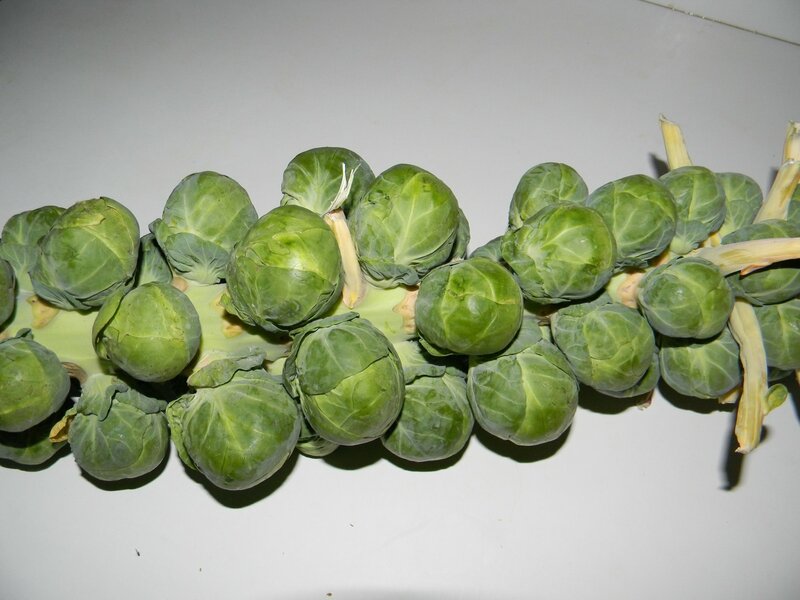 Bring to a boil and cook for 20-25 minutes. Poke a potato with a fork while in the pot to be sure they’re tender. Drain well and put the potatoes right back into the pot. Add the butter, sour cream and warm milk. Cover with the lid and allow to stand for about 5 minutes. 2) Beat with a hand mixer for about a minute so that it doesn’t have large lumps. Add additional milk if too thick. Taste. Add additional seasoning if necessary. Cover with the lid until ready to serve with the chicken. Makes about 6 servings. Simple Thai Red Chicken Curry With Steamed Rice…. I love grilling and all but I can’t stand over a hot grill in 95′ heat, come on!! When it’s like this I want a quick and delicious dinner that goes together in a snap. This is a favorite dish that fits the bill. Prep the vegetables first. Actually cooking time is only about 30 minutes. Serve over brown or white rice. Brown rice will take more time, so start it before you begin preparing the curry. Use whatever vegetables you like. I used carrots, red bell pepper, onions, sugar snap peas, and fresh basil. Add edamame, broccoli or even sliced jalepeno peppers if you’d like more heat. Feel free to substitute peeled and deveined shrimp for the chicken. Cook until the shrimp turn bright pink. The key ingredients in this dish would be the coconut milk and Red Thai Curry Paste. This curry paste is slightly spicy, it will not over power the dish with heat. It is incredibly flavorful and delicious. My recipe calls for enough to make the coconut milk slightly pink. Feel free to add more to your taste. Coconut milk lends a rich and deep flavor to the dish. 1) Heat a large heavy skillet over medium high heat. Add the prepared red pepper, carrots, and onions. Cook, stirring often, for about 4 minutes. Add the snap peas and cook another minute. Dump into a large bowl and cover loosely with foil. 2) Add the curry paste to the pan. Using a wooden spoon, mix into the oil. Add the coconut milk and whisk to combine. Add the brown sugar and whisk. Bring to a simmer. Add the raw chicken and simmer another 15 minutes. Add the sliced basil just before serving. 3) Add the basil and serve over steamed rice. Makes 5-6 servings.